I went to bed knowing I had 2 brothers (1 deceased), 3 first cousins, and with my father and grandmother being an only child, not too many distant cousins. To exhaust all 10 fingers with names of cousins, I had to include the second cousins on both my mother and father’s trees (a total of 15 first and second cousins). * But, I woke up to a slew of cousins, of all races, all ages and surnames that I never knew existed. Thanks DNA results…I now have a large family. But who are these people? Definitions: The Y-DNA tests your paternal ancestry. A male participant, and provides data on the father, grandfather, great-grandfather, etc (male line). Likewise to trace your maternal ancestry, the Mitochodrial DNA test will reveals data on a female participant, her mother, her grandmother and great grandmother, etc. But the Autosomal DNA is not gender specific. Participants will get results to include both their male and female line and the participant’s ethnic percentages. We often use DNA to help us find relatives; those distance cousins that closely match our DNA. With the autosomal tests, you will still get a lists of names of your possibly-new found cousins, but not the actual kinship. Of course that’s where genealogy and DNA analysis becomes very important. Many of these distant cousins are providing cheek swab samples and tubes of saliva even as you are reading this. Count out five generations to your great-great-great grandparents. You have 32 of them and most of the 16 couples probably had several children. Most of those children eventually married and had several more children and so on. Imagine those sixteen families all multiplying and branching out for five successive generations. You could easily have thousands of living cousins in parallel branches you know nothing about. Forensic Genealogy Cases. When tracing “war babies”, this is the a3Genealogy DNA test of choice, especially when crossing genders (female participant with male soldier/father research). Also used for adoption cases. Ethnic Breakdowns. Clients sometime need/want to know their ethnic breakdown. Of course we suggest you not do this test for this reason unless you are ready for shocking news. More than once have the results been “disturbing” to clients. The test will give an overall ethnicity percentage using both father and mother’s combined DNA in the autosomal test. Cross-gender tests. If there isn’t a living male to tests for the paternal line ancestry (Y-DNA) or no female to provide DNA samples for mitochondrial tests, this may be your only option. Medical hints. The 23andMe DNA Kit tests offers a look at your health genes. At a3Genealogy we suggest you have completed an exhaustive genealogical research for up to 5 generations. Without the paper trail of your family history, unscrambling the autosomal results is, well…., probably impossible. 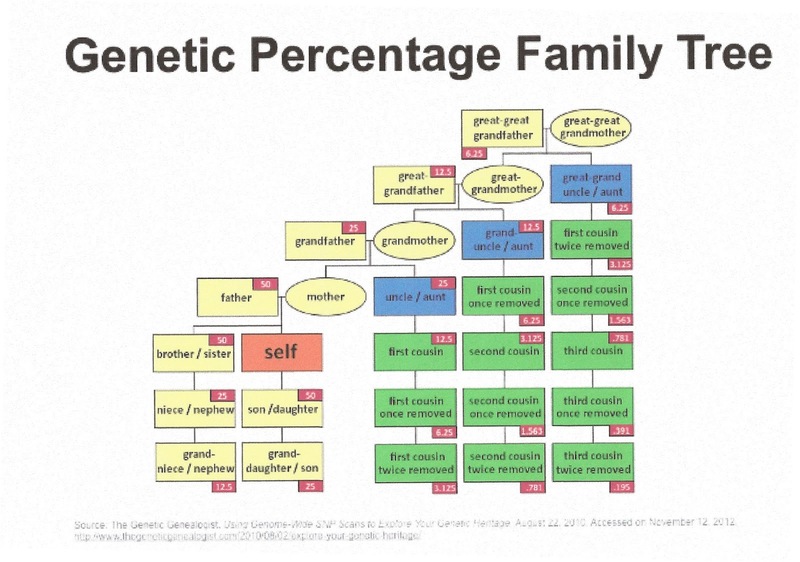 So this is not the test to use if you have not tackled a pretty strong 5 generation family trace. It is important to remember this test is for “recent ancestors”; 5 generations back. If you are trying to determine your eligibility for the Society of Charlemagne or Magna Carta, this is not the test for you (unless of course you happen to be a cousin of a society member and just need to prove the last 3-5 generations). The autosomal test (Biogeographical) does provide participant’s ethnic ancestry. This will reveal a percentage of Native American, African American (Sub Saharan) and other ethnic percentages but it will probably not be accepted as evidence for Native American Citizenship. You’ve exhausted your genealogy trace and your DNA test results have been returned; but you will probably still need assistance with an analysis of the results. How to make sense of your new possible cousins? The DNA Analysis, that includes marker mutations, family trees and comparisons, may help with defining kinships and answering questions on your family tree. At this time a3Genealogy only uses the reliable tests of 23andMe DNA and FamilyTreeDNA. Visit these sites for more information. *These are the cousins of my generation and does not include the first cousins once removed. Enjoyed this post, especially since this is what I'm currently working on in my own family history research, trying to connect to cousins through autosomal DNA results. My 5-generation family tree is fairly exhaustive, except for my Irish branches, so I have a feeling that's why so far I can't, and might not ever be able to, connect to them. Your points a really clear and easy to follow. I have one question. When you say "a pretty strong five generation family trace," I'm assuming that you mean not simply my direct ancestors, but the family trees of my ancestors' siblings, too? I have some of those, but definitely not all. So analyzing my results, when I do get an autosomal test, will probably be a really difficult unscrambling job? It is still possible. 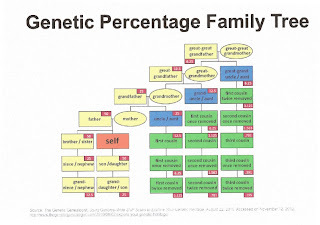 I've incorporated the charts above thanks to (Nicka Smith and Roberta Estes) and it has helped keep every one straight and cut down on our DNA analysis time. . Start by filling out a chart with you and one cousin line for your matches. It also helps if there is a surname group to assist. But remember none of this works with out the genealogy paper trail. It takes time, and patience, because you will also need to understand marker mutations if you are trying to do your own DNA analysis. 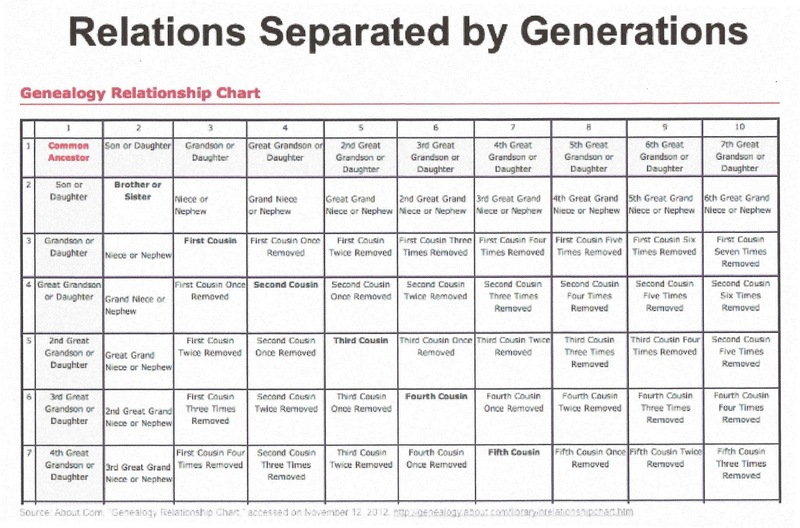 But as I mentioned, start out with family trees and the generation chart. Mariann, Excellent question. 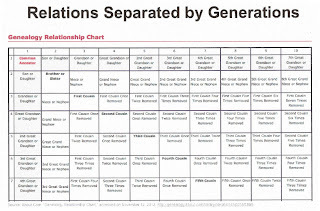 I will add a highlighted chart here, but for now block out the 1-5 generations on the chart on both the horizontal and vertical axis above and they meet at the 3rd cousin block. All within that block would be considered 5 generations. Often, due to maintaining the integrity of the test, we limit it to 3 generations and then expand a bit further. So yes ancestor siblings are included. And yes, it usually takes a bit to analyze kinships. But if you have everyone's family tree it mostly takes patience.